The RV Gourmet: Sweet But Healthy...Is it Really So? Sweet But Healthy...Is it Really So? Is it possible that one recipe can be a breakfast, brunch, lunch, dinner, snack, AND dessert food? Just ask Luana who provided just such a dish for our Spring Fling BBQ Potluck. It was the perfect accompaniment to the heavy brisket and beans main dish and the few leftovers were devoured by my teen daughter, who never eats breakfast, for breakfast. What is this miracle dish? 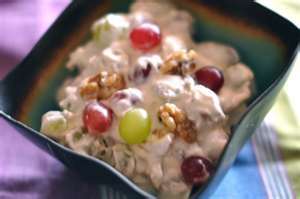 Luana calls it Grape Salad, but we call it Sweet, Tart and Crunchy. In a large bowl, mix together the cream cheese, sour cream, sugar and vanilla. Add grapes and mix until evenly incorporated. Sprinkle with brown sugar and pecans, mix again and refrigerate until serving. Made the day before, the brown sugar makes the sauce taste like caramel. You can use less brown sugar, if you wish.